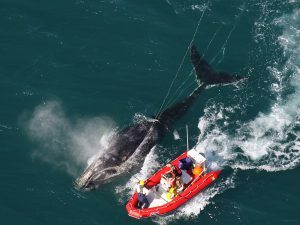 The North Atlantic right whale population is believed to be down to about 400 individuals, so when an average of 29 per year get entangled in potentially life-threatening fishing line, the implications can be catastrophic. But it’s not just whales. Marine mammal entanglement is a global problem that each year results in the death of hundreds of thousands of whales, dolphins, porpoises and seals worldwide, according to findings published in the journal Conservation Biology. The University of Florida’s Aquatic Animal Health program has played an increasingly active role in recent years in developing new knowledge relating to better ways of helping these animals, particularly right whales and dolphins — two species which, despite their difference in size, experience similar problems with entanglement. Marine mammals are especially vulnerable to hazards in areas where fishing activity is high, whether for commercial fisheries or for sport fishing. They are struck by boats, affected by loud noises from ships’ sonar and engines and, of course, entangled in nets and fishing gear meant for more edible varieties like tuna, sardines, lobster and anchovies. Sometimes the damage occurs long after the fisherman has called it a day. “Someone may toss their monofilament line overboard. A line gets caught on a rock or an underwater piece of debris and breaks off, then waits in the environment for a passing animal,” says Dr. Mike Walsh, a veterinarian and associate director of the program. Walsh worked as head veterinarian at Sea World for 21 years prior to joining UF’s faculty in 2007. He says the primary causes of injuries have shifted over time since Florida began banning certain types of fishing, such as gill netting. “Nowadays, dolphins are most likely to be entangled by crab traps or monofilament lines,” he says. Even the largest mammals on Earth are vulnerable to the hazards. “Big whales cut across vast distances of ocean during migration and that brings them into constant contact with these very large nets, some of which have anchor or buoy lines more than 600 feet long,” Walsh says. Scientists from NOAA Fisheries Service and its state and nonprofit partners successfully used at-sea chemical sedation to help cut the remaining ropes from a young North Atlantic right whale. The sedative given to the whale allowed the disentanglement team to safely approach the animal and remove 50 feet of rope wrapped through its mouth and around its flippers. As awareness about the threats posed to marine mammals by entanglement has grown over the past 50 years, so have efforts to save the charismatic creatures. The National Marine Fisheries Service, in collaboration with private organizations, now actively supports rescue efforts. The biggest responses to entanglement situations are focused on right whales, which are critically endangered, Smith says. Much of what is known about large marine mammals is based on experience caring for animals in captivity, like killer whales at Sea World. That information doesn’t always translate into sound practices for taking care of a much larger species. Marine mammal rescuers need the kind of information that university veterinary researchers and biologists can provide in order to increase the odds of success. Historically, whale disentanglement has involved physical contact with the whale, which is dangerous and fraught with logistical complications. So scientists from UF, NMFS, Woods Hole Oceanographic Institution and others began working on a new technique that could make the proposition safer for the animals and their rescuers. The second part involved coming up with the right drug cocktail for at-sea sedations. That is where UF and Walsh’s involvement was key. Determining the right amount of drug to administer — enough to sedate the animal sufficiently to allow veterinarians to safely approach it, but not so much as to endanger the animal — was a trial-and-error process that took place over several years, beginning in 2001. “The first early attempts at sedation were encouraging but not successful,” says Walsh. But a breakthrough came in 2009, when rescue teams successfully dosed a chronically entangled, emaciated North Atlantic right whale. Once the team succeeded in administering the proper dosage, they were able to remove lots of rope, Walsh says. But they had no way of tracking the animal or monitoring its progress once it was released. On three separate occasions disentanglement teams have attempted to dose whales so that they could be safely approached. Only twice have those attempts resulted in winning the animal’s cooperation, Walsh says. One of the whales died after seven days, and the scientists were not able to track the other. Since whale and dolphin biologists and scientists had been using suction cups to attach tracking devices to the animal — devices that can tell them how often it is breathing, how deep it’s diving and even what it’s hearing — it was thought that this should be one tool to use on the next animal to better study the sedation effects. The scientists at Woods Hole, including Dr. Michael Moore, developed the special drug delivery system and these unique data tags. “Our role was in coming up with the drug dosages and the parameters of evaluation to understand what the drugs were doing,” Walsh says. His team also provided basic pharmacology information from UF’s anesthesia department to try to make the approach as safe as possible. With entangled dolphins, sedatives aren’t necessary because rescuers can physically capture and restrain the animals while entanglement material is removed. Another difference between dolphins and whales in disentanglement efforts is that rescue teams frequently are able to go back and recapture dolphins after placing tracking devices on their dorsal fins. “In one case, a dolphin got entangled six times and we disentangled him four times,” Walsh says, adding that often adult dolphins become entangled — most commonly in monofilament line — due to injuries affecting their dorsal fins. Others may involve entanglements around the base of the tail or newborns with line around the body, flippers and in the mouth. Dolphins are often hit by boats and sustain damage to their dorsal fins. The injury makes them susceptible to entanglement due to a change in the dorsal fin from a smooth surface to an irregular one that snags the line. UF is currently collaborating with Woods Hole and other groups such as Marineland, Hubbs-SeaWorld Research Institute, Volusia County Marine Science Center, Harbor Branch, Mote Marine and Clearwater Marine Aquarium to analyze the relationship between the presence of rope and line in the water and entanglement. Blair Mase, with the National Marine Fisheries Service Southeast Region, coordinates the Florida-based groups. Walsh and others from UF’s Aquatic Animal Health program, including Dr. Craig Pelton from Volusia County Marine Science Center, have helped to rescue five entangled dolphins off Florida’s Coast in 2012 — including an Atlantic bottlenose dolphin known to Florida west coast locals as Seymour. Seymour was first sighted in 2006 when he was still a young calf porpoising alongside his mom in the warm surf off the Isle of Capri. But all was not well; the calf had what appeared to be a bulbous growth encircling the base of his tail that affected the way he swam. Subsequent sightings revealed the growth to be scar tissue from monofilament line wrapped around his tail. Concerned members of the community and dolphin rescue workers statewide kept track of Seymour, so-named for his frequent sightings over the years, until 2011 when it became clear that his injuries had become life threatening. A crew decided that it was time to intervene and Mote Marine Laboratory’s dolphin rescue group led the mission to save Seymour in March 2012. “We wanted to be able to X-ray the tail during the rescue so we could weigh the options for taking him into rehabilitation against leaving him in his own environment to heal,” Walsh says. The stress of adapting to a new environment during rehabilitation can sometimes make things worse. Walsh found a local equine veterinarian, Dr. Darrell Harvey, with a mobile digital radiology machine to use for the mission. And on the day of the rescue, a team of UF veterinarians used it to send images back to Dr. David Reese, a UF veterinary radiologist. Reese quickly determined that the line wrapped around the tail was causing the swelling, and that the injuries would likely heal on their own without further treatment. Once the line was cut away and the injuries treated, the team weighed and measured Seymour, then tagged him and released him back into the wild. “For me, this speaks directly to the need for additional knowledge about musculoskeletal disease, particularly that which relates to injury and changes to the skeletal structure,” Walsh says.